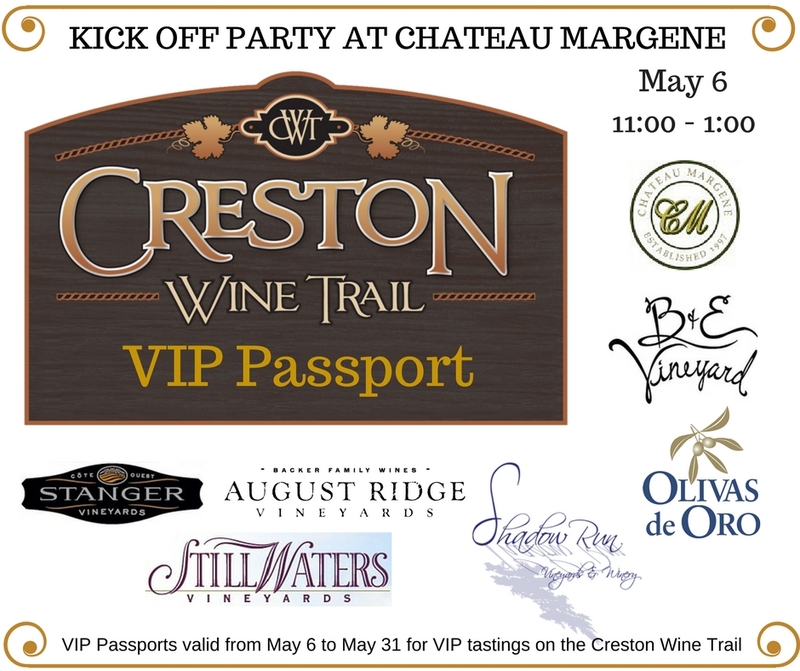 Creston Wine Trail VIP Passport - Purchase Your Passport Now! Home > Creston Wine Trail VIP Passport - Purchase Your Passport Now! Get your VIP Passport for a weekend or a month on the Creston Wine Trail. Start by attending our kickoff party at Chateau Margene on Saturday, May 6th from 11-1. Taste a selection of wine and olive oil all in one place from each of the Creston Wine Trail wineries. Learn about their offerings directly from the winemakers and the olive miller. Appetizers served by PasoTerra and music by Brazilian guitarist, Jon Stephens. When the kick off party is over, your VIP Passport entitles you to a complimentary tasting at each location and VIP hospitality. VIPs can look forward to special pairings, barrel tastings, behind the scene views and owner/winemaker access. Have your Passport stamped by each of the 6 wineries and the olive ranch anytime during the month of May. When you collect all 7 stamps you'll receive a certificate that can be used at the location of your choice for a future VIP tasting for 6 people. Your hosts for this event are August Ridge, B&E Vineyards, Chateau Margene, Olivas de Oro, Shadow Run, Stanger, and Still Waters. A portion of the proceeds will be donated to the Atascadero FFA. If you need further information, please call us at Olivas de Oro 805-227-4223.